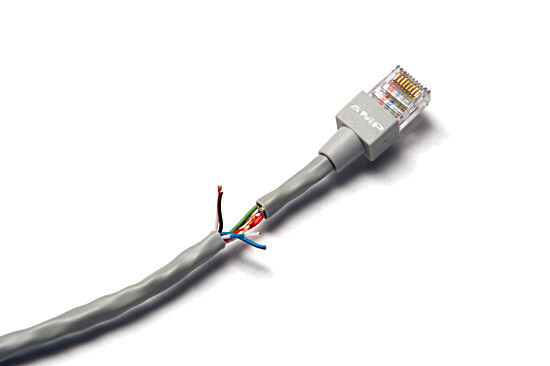 Power over Ethernet (PoE) has many uses, from powering IP phones to remote network kit. It is however a bit expensive for odd one-off things. In my case, a DSL router which ideally is located at the master phone socket, but all the other network kit including my UPS is some distance away. A cheat for 100Mbit connections has started popping up and is dubbed "Passive Power over Ethernet". As 100Base-TX only uses 2 of the 4 pairs in a CAT5 cable, this is a simple hack of using the other unused pairs for power. Note that this is not official, standard PoE and will not power (in fact might even damage) standard PoE equipment. It may also damage equipment if it is incorrectly wired, so due care needs to be taken. Do not try this if you are not completely confident in your ability to do it properly. "Passive PoE" is well within the capability of anyone handy with a soldering iron to do themselves. I started with a standard CAT5e patch lead which was the right length and removed some of the outer cover of the cable at both ends, and then cut and pulled out the Brown and Blue pairs which are normally unused. From there I soldered on two lengths of wire at each end for putting the power into the cable. As this is not a standard and is a "closed system", whichever way round you choose for the power is up to you so long as you keep it the same on both ends of the cable. From there I insulated the joints with heat shrink sleeving, and fitted DC connectors to each end. Since there is no protection against shorts in the cable (eg. someone puts something heavy on the cable), I added an in-line fuse holder for extra safety. 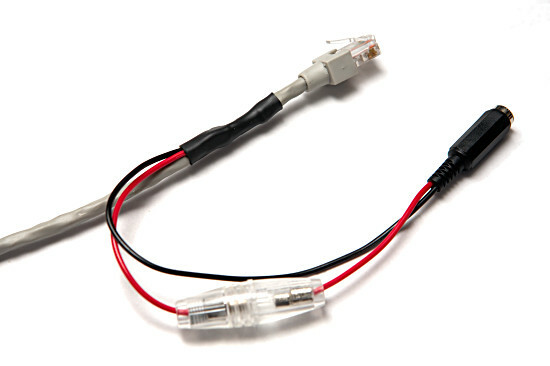 Once the cable is assembled, test it out with a meter and make sure there are no shorts and everything connects through correctly. In my case with a 10 meter cable I ended up with 0.5 ohm on each pair making 1 ohm total for the cable. 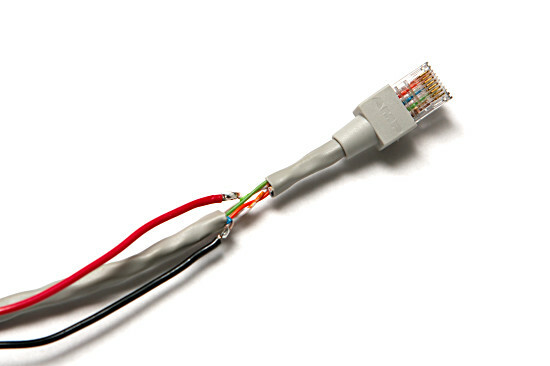 Many small devices will happily run with this sort of cable, especially if they run from an unregulated supply as it means that they will have all the regulation they need built into the device.